Day 1 – 420 miles. Kissed my cats goodbye, watered the milkweed and said a prayer to protect my kids and caterpillars while we’re traveling around the country living and learning new things. We had a nice ride only stopping a few times for fuel and food. Close to the end of our day we veered off the interstate to swing by and visit the #2 Best Small Town in America – Bay St. Louis – to take a look around. We weren’t disappointed. If you remember, Bay St. Louis was one of the towns that was seriously damaged during Katrina. They have certainly come along way since the storm. We visited a bar named Gabbies in Old Town Bay St. Louis and met the bartender, Laurie and a couple of patrons while sipping on a cold beer. Everyone shared stories. We learned that Gabbies was built on high ground and they only had 3-4 feet of water in the place during Katrina. They faired well considering the magnitude of the storm. Frank and I shared the details of our trip to the New England states via train from Sanford, Fl to Virginia – our way to fast forward through country we’ve traveled a million times before. The train would be a new adventure. Patron Capt Ted said he used to live up north. If we got up to Warren County, New York be sure and stop in at the Blue Moose Bar – Exit 19 or 20 – he wasn’t sure but said we can’t miss it because it has a big blue moose out front. He said tell them to give us a beer on him. When he left, Laurie said Capt Ted was on his way to Florida on a job. She asked if we’d seen his pet pig Norman in the back of his truck. I’d seen the pet crate but didn’t know there was a pet pig inside. She said they were going to miss seeing old Capt Ted walking around town with Norman on a leash. Now that’s a sight I wish I’d seen. We said goodbye to our new friends and hit the road again. We were 30 miles from the Hard Rock Casino in Biloxi, where we were staying the night. When we arrived the bellman, Shaun greeted us with a “Welcome back.” He remembered us from our last trip when we encountered torrential rain and had to leave the bikes there for 4 days. What a mess that was. It was time for a hot shower and have a tasty meal at Ruth Chris’. Next stop … Black Jack tables. After an hour or two we were up about $500 and decided we should call it a day … and what a great day it was! 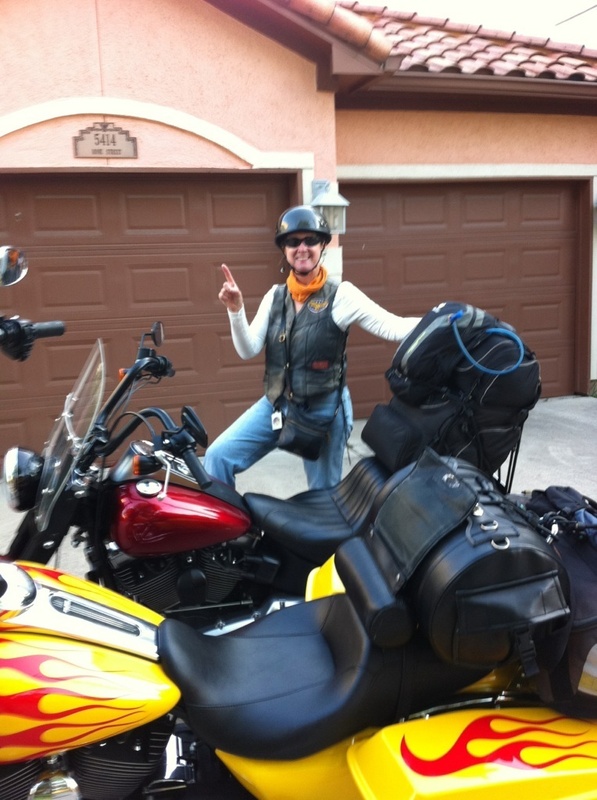 This entry was posted in On The Road Again and tagged bike trips, harley traveling, motorcycle trip, travel motorcycle, women motorcycle. Bookmark the permalink.